EuroGenomics Cooperative is one of the stakeholders in the European H2020 project GenTORE: "GENomic management Tools to Optimize Resilience and Efficiency." 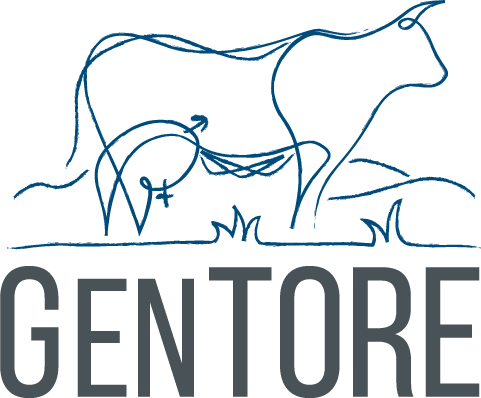 GenTORE will develop innovative genome-enabled selection and management tools to empower farmers to optimize cattle resilience and efficiency (R&E) in different changing environments. Resilience is defined as the capacity to safeguard future ability to continue contributing genes to the next generation when confronted with environmental perturbations. Efficiency is defined as the ratio of energy in the product to the energy ingested to achieve that production, measured over a time period that is relevant to ensure that efficiency gains are sustainable. EuroGenomics participates as stakeholder in this project to give input in the form of ideas and views regarding the research and subsequent outputs. Also, by being a stakeholder, EuroGenomics could benefit from new technologies and data. The goal is that project outputs are fit for purpose and immdediately relevant to what is happening in daily practice on cattle farms. They will be more user-friendly and thus adoprted rapidly and seamlessly by farmers and breeders. On 15-16th of May 2018, GenTORE's first Annual Meeting took place, during which the different work packages and their leaders were introduced. Special focus was on the inclusion of the stakeholders in the project and its work packages. There was the possibility to attend work package specific meetings in which the different tasks and contributions were discussed in detail. The Annual Meeting ended with an interactive stakeholder speeddating session. Time flew by during this part of the meeting when it was possible to directly interact with work package leaders to discuss where stakeholders could support GenTORE and how stakeholders in their turn could benefit from the research done within the project. EuroGenomics is looking forward to continue being a stakeholder in the GenTORE project. If you would like to stay up-to-date on activities within GenTORE please subscribe to their mailing list here. As stakeholder inclusion is important to improve GenTORE outcomes, it's possible to actively join discussions. If you would like to participate, please register here to the GenTORE Stakeholders E-Platform.